You can't call yourself a Filipino if you don't know at least one Aegis song. Few would admit it, probably because the local band's brand of rock music is considered pang-masa, but ask anyone, even the affluent (save perhaps those from the younger generation), if they know at least the chorus of "Halik" or the melody of "Basang-basa sa Ulan" and you're likely to get a yes. I grew up listening to some OPM but mostly by bands such as Eraserheads and Parokya ni Edgar. Commuting to and from my high school alma mater more than a decade ago, however, I would always hear Aegis' music on the "baby bus" or tricycle. Even when I wasn't taking public transport, some sari-sari store's radio on my way somewhere would be blaring "Luha," or some family, finding the afternoon weather unbearably hot, would be leaving their door and windows open as they watched a singer-wannabe belt out "Sinta" on a noontime TV show's talent competition. Aegis' music is inescapable. Proving exactly how big of an impact Aegis' music has made in Filipino culture, Rak of Aegis was created and had its first run of 42 sold-out shows earlier this year. The hit comedy musical due to popular demand started its second run on June 20, with shows until August 31, still at the PETA Theater Center, New Manila. And it is fantastic. I've seen the set before on my friend Koji's blog, but it still wowed me when I finally saw it in person. The setting of the musical is an impoverished barangay called Villa Venizia, appropriately named because the houses are raised above shin-deep polluted water and the only way to get from place to place is either on foot traversing makeshift planks or by boat. What might initially appear as bird houses in the background are actually the distant homes of other villagers. When it rains, it isn't just special effects but actual water pouring from above and from the eaves of the main character Aileen's family's house and Jewel's sari-sari store. Kudos to Mio Infante for the production design. Aicelle Santos was great as wide-eyed international singer-wannabe Aileen, who has a dream of getting a music video of her to go viral on YouTube and eventually get noticed by Ellen DeGeneres. Isay Alvarez-Seña was, of course, brilliant as Mary Jane, Villa Venizia's barangay captain and mother to Kenny, played by Myke Solomon. Isay's real-life husband Robert Seña portrayed the role of Kiel, Aileen's proud dad. Arnell Pineda's acting for his role as Fernan sort of reminded me of his portrayal of Gomez in The Addams Family, only in Tagalog. Cacai Bautista as Mercy, Aileen's mother, was utterly hilarious (I had to have a photo taken with her after the play), and so was Jimmy Marquez as Joel/Jewel, Aileen's best friend. But the real scene-stealer was Pepe Herrera who played Tolits, ferryman and third member of the Aileen-Kenny-Tolits love triangle. I got teary-eyed during the show, not because of the dramatic scenes but because the musical somehow manages to encapsulate what's going on in our country right now. Contrary to what most articles have said about Rak of Aegis, it is not just about the Filipino people's resilience in the midst of calamities and our perpetual need to sing eardrum-splitting karaoke that can be heard barangay-wide. 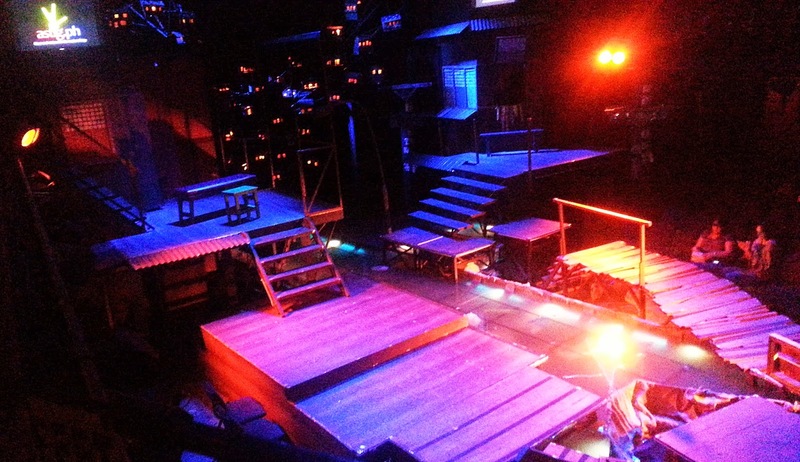 Rak of Aegis is everything Filipino, which includes our bad side. There's poverty. Corrupt, wealthy people who mistreat the weak and the less fortunate. The "I'll buy an expensive living room rug for show and so I could feel good about myself, but won't let guests at my house step on it" attitude. Our inclination toward get-rich-quick schemes, which in today's Facebook and YouTube age have been replaced by get-viral-and-hopefully-rich-thereafter-quick schemes. Our tendency to turn handicaps (e.g the flooding in the story) into emotional crutches (e.g. something we can milk for all it's got so we can earn money). And our penchant for looking toward the government for solutions, sometimes rightly so but more often than not incorrectly when we can be the solutions ourselves. But yes, there's also a lot of good in the musical's being everything Filipino. Our creativity and resourcefulness. Our love for social media and music. Close family ties. Pride. Unity in times of desperate need, particularly when our community or country is being taken advantage of by someone from the outside. Our great sense of humor. The title itself—a pun on the hit Broadway musical Rock of Ages—shows our sharp wit and knack for copying or imitating stuff, which is not necessarily a bad thing because having been conquered many times, it is quite understandable for our country to be once in a while confused with its own identity...just as long as in the end we get back to being sure of who we are. 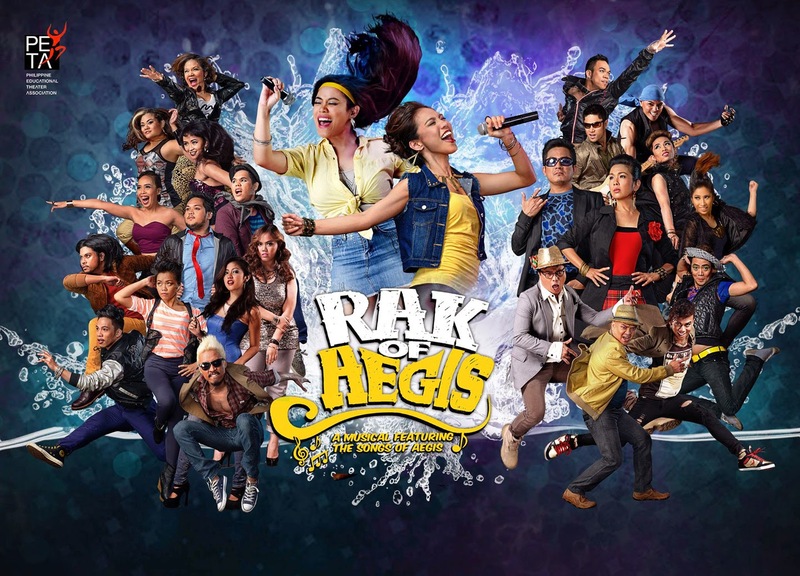 Aside from the title pun, however, everything else about Rak of Aegis is original. I hope we could create more plays of this sort in the future. Rak of Aegis was written by award-winning playwright Liza Magtoto and directed by PETA Theater Center's artistic director Maribel Legarda, with musical arrangement and direction by Myke Salomon. Also lending to the beauty of the entire production are Jonjon Villareal (lighting design), Carlo Pagunaling (costume design), Maco Custodio (shoe design), Joan Pamintuan (accessory design) and Gio Gahol (choreography). I enjoyed everything from start to finish, from the comedic pre-show and intermission reminders and the snappy scene transitions, to the witty one-liners and the singing (pretty sure I'll be LSS-ing on Aegis songs for a while). I was lucky to have seen Rak of Aegis during its second run (oddly enough, just like I was lucky enough to have seen Rock of Ages during its second run last year). Don't miss it. You may buy tickets over the counter or online at TicketWorld...while they're still not sold out. some of the load off, I'd absolutely love to write some material for your blog in exchange for a link back to mine.